This protocol describes the specific techniques used for the structural characterization of reducing end (RE) and internal region glycosyl sequence(s) of heteroxylans by tagging the RE with 2 aminobenzamide prior to enzymatic (endoxylanase) hydrolysis and then analysis of the resultant oligosaccharides using mass spectrometry (MS) and nuclear magnetic resonance (NMR). Ratnayake, S., Ford, K., Bacic, A. Sequencing of Plant Wall Heteroxylans Using Enzymic, Chemical (Methylation) and Physical (Mass Spectrometry, Nuclear Magnetic Resonance) Techniques. J. Vis. Exp. (109), e53748, doi:10.3791/53748 (2016). This protocol describes the specific techniques used for the characterization of reducing end (RE) and internal region glycosyl sequence(s) of heteroxylans. De-starched wheat endosperm cell walls were isolated as an alcohol-insoluble residue (AIR)1 and sequentially extracted with water (W-sol Fr) and 1 M KOH containing 1% NaBH4 (KOH-sol Fr) as described by Ratnayake et al. (2014)2. Two different approaches (see summary in Figure 1) are adopted. In the first, intact W-sol AXs are treated with 2AB to tag the original RE backbone chain sugar residue and then treated with an endoxylanase to generate a mixture of 2AB-labelled RE and internal region reducing oligosaccharides, respectively. In a second approach, the KOH-sol Fr is hydrolyzed with endoxylanase to first generate a mixture of oligosaccharides which are subsequently labelled with 2AB. The enzymically released ((un)tagged) oligosaccharides from both W- and KOH-sol Frs are then methylated and the detailed structural analysis of both the native and methylated oligosaccharides is performed using a combination of MALDI-TOF-MS, RP-HPLC-ESI-QTOF-MS and ESI-MSn. Endoxylanase digested KOH-sol AXs are also characterized by nuclear magnetic resonance (NMR) that also provides information on the anomeric configuration. These techniques can be applied to other classes of polysaccharides using the appropriate endo-hydrolases. Heteroxylans are a family of polysaccharides that are the predominant non-cellulosic polysaccharides of the primary walls of grasses and the secondary walls of all angiosperms3-6. The xylan backbones differ in their types and patterns of substitution with glycosyl (glucuronic acid (GlcA), arabinose (Araf)) and non-glycosyl (O-acetyl, ferulic acid) residues depending upon tissue type, developmental stage and species7. Walls from wheat (Triticum aestivum L.) endosperm are composed primarily of arabinoxylans (AXs) (70%) and (1→3)(1→4)-β-D-glucans (20%) with minor amounts of cellulose and heteromannans (2% each)8. The xylan backbone may be variously un-substituted and predominantly mono-substituted (primarily O-2 position and to a lesser extent O-3 position) and di-substituted (O-2 and O-3 positions) with α-L-Araf residues9. The reducing end (RE) of heteroxylans from dicots (for example, Arabidopsis thaliana)10 and gymnosperms (for example, spruce (Picea abies))11 contains a characteristic tetrasaccharide glycosyl sequence; -β-D-Xylp-(1→3)-α-L-Rhap-(1→2)-α-D-GalpA-(1→4)-D-Xylp. To understand heteroxylan biosynthesis and function (biological and industrial), it is important to fully sequence the xylan backbone to understand the types and the patterns of substitutions as well as the sequence of the reducing end (RE). Specific techniques used for the structural characterization of reducing end (RE) and internal region glycosyl sequence(s) of heteroxylans are described in this manuscript. The techniques rely on fluorophore tagging (with 2 aminobenzamide (2AB)) the reducing end (RE) of the heteroxylan chain prior to enzymatic (endoxylanase) hydrolysis. This approach, particularly for the RE sequencing, was first reported by the York laboratory10,12-13 but is now extended to include the internal region sequencing and is a combination of established techniques that is equally adaptable to all heteroxylans independent of their source of isolation. This approach can also be applied to other classes of polysaccharides using (where available) the appropriate endo-hydrolases. In the present study, de-starched wheat endosperm cell walls were isolated as an alcohol-insoluble residue (AIR) and sequentially extracted with water (W-sol Fr) and 1M KOH containing 1% NaBH4 (KOH-sol Fr) as described in Ratnayake et al. (2014)2. The released oligosaccharides from both W- and KOH-sol Frs are then methylated and the detailed structural analysis of both the native and methylated oligosaccharides is performed using a combination of MALDI-TOF-MS, ESI-QTOF-MS-coupled with HPLC with the online chromatographic separation using a RP C-18 column and ESI-MSn. Endoxylanase digested KOH-sol AXs was also characterized by nuclear magnetic resonance (NMR). Incubate W-sol AXs with 2AB (0.2 M) in the presence of 1 M NaBH3CN (sodium cyanoborohydride) (pH 5.5) for 2 hr at 65 °C to convert the reducing ends of the polysaccharide backbone chains to their fluorescent derivatives. CAUTION: The following step should be performed in the fume hood as NaBH3CN releases poisonous cyanide gas when it is in contact with water. Weigh out NaBH3CN (62.8 mg) and dissolve in water (1 ml) in a microcentrifuge tube (1.5 ml) to prepare a 1 M NaBH3CN solution. Dissolve 2AB reagent (27.2 mg) in 1 M NaBH3CN solution (1 ml) by heating at 65 °C and adjust the pH of the reaction mixture (0.2 M 2AB, 1 M NaBH3CN) to pH 5.5 with 10% acetic acid. Add 200 µl of reaction mixture (0.2 M 2AB, 1 M NaBH3CN) to W-sol AXs (1 mg) in a glass tube with a cap and mix using a vortex mixer. Incubate for 2 hr at 65 °C in a fume hood. Cool the suspension to RT and add 4 vols. of absolute ethanol. Place the suspension in a cold storage (4 °C) O/N to precipitate polysaccharides. Centrifuge (1,500 x g, 10 min, RT) to remove supernatant. Wash the pellet extensively with absolute ethanol (4x), acetone (1x) and methanol (1x), centrifuging between each wash. Vacuum dry at 40 °C O/N. Note: Extensive washing also removes residual 2AB. Dissolve 2AB labelled W-sol AXs (1 mg) in 500 µl of sodium acetate buffer (100 mM, pH 5) in a microcentrifuge tube (1.5 ml). Add 4 units of endoxylanase (GH 11, [M1]) and incubate at 37 °C for 16 hr. Destroy enzyme activity by heating the reaction mixture for 10 min in a boiling water bath. Cool the suspension to RT and transfer to glass tube with a cap. Add 4 vols. of absolute ethanol and place the suspension in a cold storage (4 °C) O/N to precipitate any undigested polysaccharides. Centrifuge (1,500 x g, 10 min, RT) to separate undigested polysaccharides (pellet) and endoxylanase generated xylo-oligosaccharides (supernatant). Decant supernatant into a clean glass tube and place it into a warm water bath (40 °C). Evaporate the ethanol under a stream of nitrogen gas to an end point volume (~500 µl). Freeze the supernatant at -80 °C for 4 hr and dry the frozen supernatant in a freeze dryer to recover xylo-oligosaccharides. Treat KOH-sol AXs with endoxylanase (GH 11, [M1]) to generate xylo-oligosaccharides as described above (sections 2.1-2.4). Treat endoxylanase generated xylo-oligosaccharides from KOH-sol AXs with 2AB reaction mixture (0.2 M 2AB, 1 M NaBH3CN) as described above (sections 1.1.1-1.1.2). Decant supernatant into a clean glass tube and place it into a warm water bath (40 °C). Evaporate the ethanol under a stream of nitrogen gas to an end point volume (~500 µl). Freeze the supernatant at -80 °C for 4 hr and dry the frozen supernatant in a freeze dryer to recover xylo-oligosaccharides. Add a small scoop of 2, 5-dihydroxbenzoic acid (DHB) to 50% acetonitrile (500 ml) containing 0.1% formic acid in a tube (MALDI-matrix solution). Mix using a vortex, if it dissolves quickly, add another small scoop of DHB. Note: Ideal concentration of MALDI-matrix solution is 10 µg/µl-1. Deposit the aqueous oligosaccharide (native) samples (5-10 µg) (W-sol and/or KOH-sol) onto a MALDI-target plate. Add 0.3 µl MALDI-matrix solution using a separate tip and mix by pipetting up and down. Allow the mixture to dry at RT. Note: Properly dried samples should consist of long needle-shaped crystals pointing toward the center of the spot. If the deposit is sticky and/or smeary the sample may either be too concentrated or consist of salts, such deposits are unlikely to produce good spectra and the sample should be purified further. Introduce the target plate into the MS source and operate in positive (+ive) ion mode. Adjust the accelerator voltage to 19.0 kV at ion source 1 and 16.3 kV at ion source 2. Adjust the laser power to greater than 70%. Select the sample spot on the MALDI-target plate and click start to begin laser shots. Note: All areas of the target will not yield signals. A particular spot will only give a signal for a few laser shots due either to depletion of the sample/matrix mixture or characteristics of the crystal. Move the laser to different areas of the target during acquisition and average approximately 200 random spectra to obtain satisfactory signal-to-noise. Analyze endoxylanase-generated oligosaccharides (native) using nano-HPLC coupled with an electrospray ionization (ESI) quadrupole time of flight (QTOF) MS instrument with online chromatographic separation using a RP C-18 column (75 µm x 150 mm; 3.5 µm bead size). Transfer the endoxylanase-generated aqueous oligosaccharides mixture into a vial and place into the HPLC auto sampler. Program the elution gradient of 5-80% with the mobile phases 0.1% (v/v) formic acid in water and 0.1% (v/v) formic acid in acetonitrile, respectively, over 60 min. Adjust the flow rate to 0.2 µl/min. Adjust the positive-ion mode in the scan range of 300-1,600 m/z and a scan-rate of 0.5 scans/second using the ESI source conditions as follows: curtain gas 10, GS1 4, source temperature 100 °C, ion spray voltage 2,300 V, and de-clustering potential 50 V. Run the LC chromatographic program and elute oligosaccharides. The resultant total ion chromatogram (TIC) is saved automatically by the software. Open the saved TIC and select extract chromatogram. Type the expected masses (e.g., 271, 403, 535, 667, 799 and 931 m/z) at the command line. Scan chromatogram by clicking Enter. Process the selected ion scans of the ESI-QTOF MS chromatogram data using software according to the manufacturer's instructions14. Insert 1 to 2 µl of per-O-methylated oligosaccharide (methylated as described by Pettolino et al.1) sample in 50% acetonitrile into a nanospray tip using a syringe. Trim the nano-spray tip using a glass cutter to fit into the discrete nano-spray holder attached to the MS.
Set the mass according to the expected mass range (200-1,500 m/z) and curtain gas to 10, ionspray voltage at 1,900 V and polarity to positive. Press the acquire button to open relevant window, enter data file name to obtain a total ion scan (ESI-MS1). Then press the STOP button. Change scan type from product ion to fragment a peak of interest. Enter the mass of interest (e.g., 885 m/z) to fragment and adjust the mass range (200-900 m/z). Press the acquire button and adjust the collision energy (up and/or down in the compound tab) to achieve entire fragmentation of parent ion (885 m/z) and acquire a fragment ion scan (ESI-MS2). Enter the mass of fragment ion of interest (e.g., 711 m/z) and adjust the mass range (200-720 m/z). Press the acquire button and adjust the collision energy to achieve entire fragmentation of precursor ion (711 m/z) and acquire a fragment ion scan (ESI-MS3). Dissolve endoxylanase generated mixture of oligosaccharides (KOH-sol, native form) (~500 µg) in D2O (1.0 ml, 99.9%) in a plastic test tube (15 ml). Freeze the suspension at -80 °C for 4 hr and dry the frozen suspension in a freeze dryer to recover xylo-oligosaccharides. Repeat 7.1 twice in order to fully exchange the H2O with D2O. Dissolve dried oligosaccharides in D2O (0.6 ml, 99.9%) and add 0.5 µl of acetone (5% in D2O) as an internal standard. Transfer the deuterated oligosaccharides into the NMR sample tube. Hold the NMR tube containing sample by the top and insert the sample tube in a plastic spinner. Place the spinner in the sample depth gauge. Push or pull the sample tube to adjust the depth of the sample to ensure that the center line of the sample top and bottom depth gauges are equal. Remove the depth gauge and insert the sample into the auto sampler attached to a 600 MHz NMR spectrometer equipped with a cryo-probe. Login and open spectrometer control software. Enter the sample file name. Open an existing dataset and then use the "edc" command to save it to under a new name. Type the position number of the sample in the auto sampler and press "ENTER". Note: Pressing the "ENTER" button will drop the sample tube gently to the magnet bore where it will be positioned at the top of the probe. Set the desired sample temperature by typing "edte" at the command line. Wait for the sample temperature to reach the desired value before proceeding to the next step. Enter " lock" at the command line and select appropriate solvent (D2O). Wait for the " lock finished" message to appear at the bottom of the window. Type "atmm" at the command line and click "optimize" at the top of the atmm menu bar. Choose start for tuning and matching of the probe for the selected channel (1H in this case). Type "topshim" at the command line for the shimming process in which minor adjustments are made to the magnetic field until uniform magnetic field is achieved around the sample.Acquire the signal by typing "zg" at the command line and enter. Analyze spectra using software15 according to the manufacturer's instructions with 1H chemical shift referenced to an internal standard of acetone at 2.225 ppm. Endoxylanase digestion of 2AB-labelled W-sol AXs generates a mixture of 2AB-labelled RE oligosaccharides and a series of un-labeled (without 2AB label) oligosaccharides derived from the internal regions of the xylan chain (Figure 1; from Ratnayake et al.2). A series of chromatographic approaches is then employed to fractionate the complex mixture of isomers. Finally, MS techniques are utilized to identify the isomeric structures that are then sequenced by MSn techniques. Here we present a representative, rather than comprehensive, example of the approach. The signals in the MALDI-TOF-MS spectrum of oligosaccharides derived from 2AB-labelled native W-sol AXs (Figure 2A) include a highly abundant pseudo-molecular ion series at m/z 701, 833, and 965 representing a series of unlabeled neutral internal region oligosaccharides with 5-7 pentosyl residues (P5-7), respectively. A series of signals at m/z 745, 877, and 1009, designate that an unlabeled acidic oligosaccharide series, with P4-6+HexA1 (Hexuronic acid), is also present in this fraction (Figure 2A). Pseudo-molecular ions at m/z 821 and 953 indicate the presence of the 2AB-labelled original RE oligosaccharides P5-6+2AB, respectively. The ESI-QTOF-MS analysis for the native oligosaccharides with an on-line chromatographic fractionation of oligosaccharides by RP C-18 HPLC is then performed. Figure 2B and 2C, shows the selected ion scans, extracted from ESI-QTOF-MS total ion chromatogram (TIC), of oligosaccharides released by endoxylanase from W-sol Fr AXs. The signals include a pseudo-molecular ion series assigned as [M + NH4]+ at m/z 696, 828, 960, 1092, 1224, and 1356 representing a series of internal region neutral oligosaccharides with 5-10 pentosyl residues (P5-10), respectively (Figure 2B). Several isomeric structures are possible for an oligosaccharide of a defined mass (see below ESI-MSn analysis). Hence the multiple peaks for each of the molecular ion scans are possible as observed in Figure 2B. Pseudo-molecular ions assigned as [M + H]+ at m/z 271, 403, 535, 667, 799, and 931 indicate the presence of a 2AB labelled RE oligosaccharide series P1-6+2AB, respectively (Figure 2C). The signals detected as [M + H]+ ions at m/z 613, 745, 877, 1009, 1141, and 1273 indicate the presence of an acidic oligosaccharides with P3-8+HexA1, respectively (Figure 2C). In the commelenid monocots, the xylan backbone can also be substituted with phenolic acids, primarily ferulic acid (and also p-coumaric acid), which has the same molecular mass as glucuronic acid and can be detected in W-sol AXs of wheat endosperm cell walls. However, further analysis of W- and KOH-sol AXs using ESI-MSn (and compositional analyses by GC-MS of TMS derivatives following methanolysis; not shown here) confirm the acidic oligosaccharides with P3-8+HexA1 in wheat endosperm AXs. 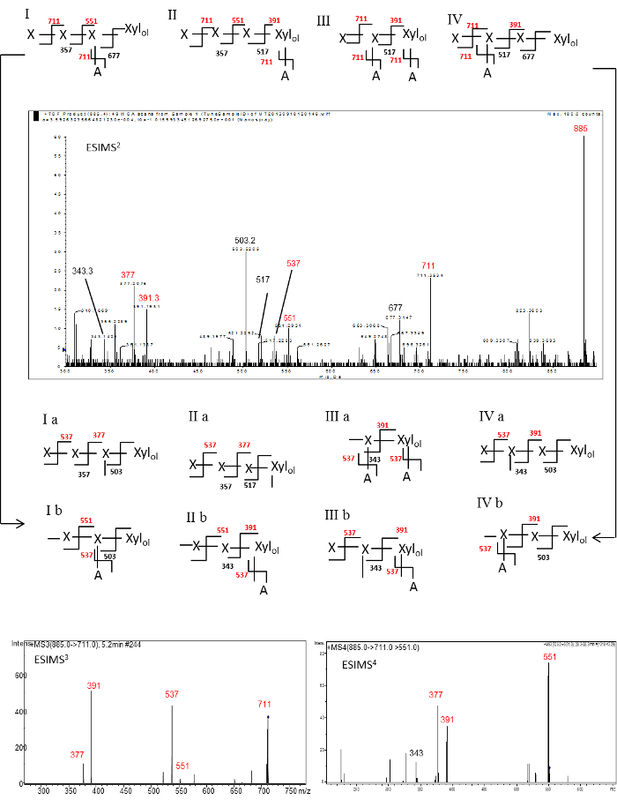 The signals assigned as [M + H]+ ions of ESI-Q-TOF full scan spectrum of the region between 3.10-3.48 min (Figure 2D) includes the series of 2AB labelled RE oligosaccharides: m/z 271, 403, 535, 667, 799, 931, 1063, and 1195 (P1-8+2AB, respectively). A series of pseudo-molecular ions in the ESI-Q-TOF full scan spectrum of the region between 3.59-4.05 min (Figure 2E) represent the internal region acidic oligosaccharides observed as both [M+Na]+ ions: m/z 613, 745, 877, 1009, and 1141 (P3-7+HexA1, respectively) and [M + NH4]+ ions: m/z 740, 872, 1004, 1136, and 1268 (P4-8+HexA1, respectively). In order to sequence the individual oligosaccharides, we performed ESI-MSn on the per-O-methylated oligosaccharides rather than on the native oligosaccharides obtained from W-sol and KOH-sol AXs since it is challenging to unequivocally assign structures by sequencing native oligosaccharides. In addition, it also requires greater quantities of material. Methylation of the oligosaccharides was carried out as described by Pettolino et al.1. The ESI-MSn investigations performed on the RE neutral oligosaccharide alditols derived from KOH-sol AXs, and 2AB labelled neutral RE oligosaccharide derived from W-sol AXs are described below as an example to assist in the interpretation of the spectra and deduced structures. The same approach can be applied to all the oligosaccharides generated from enzymic hydrolysis. The fragment ions in the ESI-MSn spectra were identified as Y and B ions according to Domon & Costello.16 Un-methylated hydroxyl group(s) generated during gas-phase fragmentation of per-O-methylated oligosaccharides in MSn provides a 14Da mass difference "scar" that can be used to identify the branching pattern and the glycosyl sequences.12-13 Each scar generated by the fragmentation event is marked as a solid line (Figures 3 and 4). As several isomeric structures are possible for a defined mass, then in these isomeric structures, Y and B ions are labelled in red and black, respectively. The ESI-MS2, ESI-MS3 and ESI-MS4 spectra of per-O-methylated RE neutral oligo-glycosyl alditol generated from the fragmentation of the pseudo-molecular ion m/z 885 (P4+Xylol) is shown in Figure 3. The ESI-MS2 spectrum includes the abundant Y ions at m/z 711, 551, and 391 generated by the loss of one, two and three pentosyl residues, respectively, from the parent ion. The abundant m/z 711 ion can be generated by either the loss of a non-reducing terminal end Xyl residue or by the loss of a terminal side chain Ara residue. The diagnostic Y m/z 391 ion in the resulting spectrum can be generated from the loss of three non-reducing end Xyl residues from the RE oligosaccharide which has a side chain Ara residue on the RE Xylol residue or the RE oligosaccharide which has a side chain Ara residue on the 2nd Xyl residue from the RE Xylol residue. Although there is a formal possibility that other structures, such as Xyl4-Xylol, and (Ara)Xyl-Xyl-Xyl-Xylol would give rise to this fragment ion these structures are excluded from consideration as the specificity of the endo-xylanase used to cleave the polysaccharide would either degrade or not cleave at the glycosidic linkage adjacent to a branch point, respectively. Correspondingly, the diagnostic Y m/z 551 ion can be generated from the loss of two non-reducing end Xyl residues from the RE oligosaccharide which has the side chain Ara residue on either the RE Xylol residue or the RE oligosaccharide which has the side chain Ara residue on the penultimate Xyl residue. Thus, four possible isomeric structures can be proposed (Figure 3: I, II, III and IV). The abundant Y ion m/z 377 (see Figure 3: Ia and IIa) and B ion m/z 503 (see Figure 3: Ia, Ib, IVa and IVb) generated from further fragmentation of isomeric precursor m/z 711 ion are also observed in this spectrum. The ESI-MS3 spectrum (Figure 3) recorded by the fragmentation of isomeric precursor m/z 711 ions included a major peak at m/z 537 (Y ion of P2+Xylol with two scars; generated from the precursor ion Ia, Ib, IIa, IIb, IIIa, IIIb, IVa and IVb) and m/z 391 (Y ion of P1+ Xylol with one scar; generated from the precursor ion IIb, IIIa, IIIb, IVa and IVb). These two major peaks (m/z 537and m/z 391) can be generated by the loss of one and two non-reducing terminal Xyl residues, respectively, from the isomeric precursor m/z 711 ion generated from the fragmentation of the pseudo-molecular parent ion m/z 885 (P4+ Xylol) during ESI-MS2. Relatively lower abundance peaks at m/z 377 (Y ion of P1+ Xylol with two scars; generated from the precursor ion Ia and IIa) and 551 (Y ion of P2+ Xylol with one scar; generated from the precursor ion Ib and IIb) were also observed in this spectrum. The ESI-MS4 of the fragmentation of the isomeric precursor m/z 551 ions included a major peak at m/z 377 (Y ion of P1+Xylol with two scars) and m/z 391 (Y ion of P1+ Xylol with one scar) generated from the precursor ion of structures I and II. Therefore the collective evidence suggested that the RE glycosyl sequence consists of the Ara side chain attached to the RE Xylol residue (diagnostic fragmentation pathway m/z 885→711→551→391; Figure 3II), Ara side chain attached to both RE Xylol and the penultimate (1st Xyl residue from RE Xylol) Xyl residue (diagnostic fragmentation pathway m/z 885→711→537→391; Figure 3III), Ara side chain attached to the penultimate (1st Xyl from RE Xylol) Xyl residue (diagnostic fragmentation pathway m/z 885→711→537→377; Figure 3I) and the Ara side chain attached on the 2nd Xyl residue from the RE Xylol (Figure 3IV). The presence of these ions confirms the proposed isomeric structures I, II, III and IV and the neutral RE oligosaccharide structure of: -[Araf-(1→3)](+/-)-Xylp-(1→4)-[Araf-(1→3)](+/-)-Xylp-(1→4)-[Araf-(1→3)](+/-)-Xylp. The ESI-MS2 spectrum of per-O-methylated 2AB labelled RE oligosaccharide generated from the fragmentation of the quasi-molecular [M+Na]+ ion at m/z 871 (P4+2AB) is shown in Figure 4. This spectrum includes the most abundant Y ion at m/z 697 (P3+2AB with one scar), m/z 537 (P2+2AB with one scar) and m/z 377 (P1+2AB with one scar), generated by the loss of either one, two or three non-reducing pentosyl residues, respectively. The m/z 697 ion can be generated by either the loss of a non-reducing terminal end Xyl residue or by the loss of a terminal Ara residue whereas the m/z 537 ion can only be generated by the loss of two terminal Xyl residues. The diagnostic fragmentation pathway (m/z 871→697→537→377) suggested that the existence of linear un-branched xylan backbone oligosaccharide(s) at the RE corresponding to the quasi-molecular ion m/z 871 (P4+2AB). However the linear un-branched xylosyl backbone (P4+2AB) is susceptible to site specific endoxylanase for further digestion. Therefore two isomeric m/z 697 ions can exist. Accordingly two possible isomeric structures are proposed (Figure 4: I and II). In these isomeric structures Y and B ions are labelled in red and black, respectively. 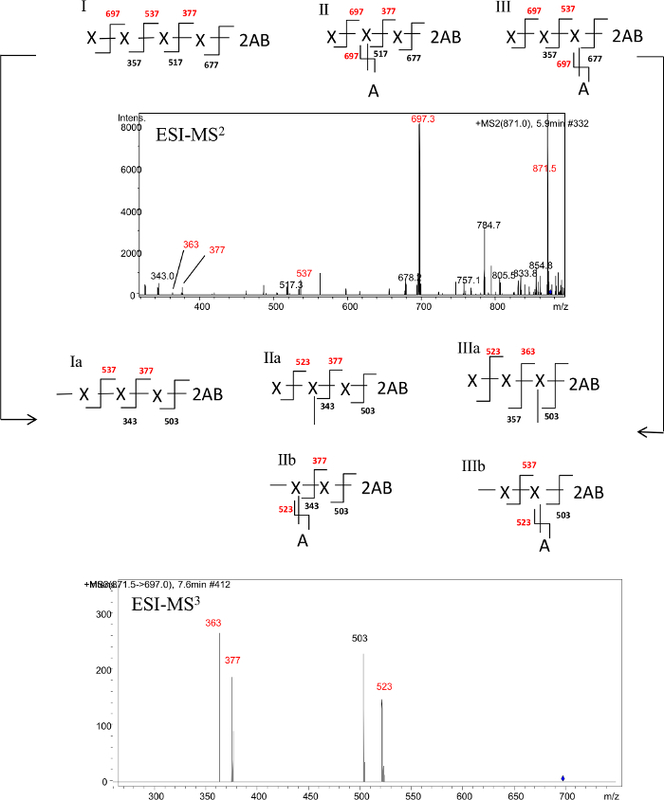 The ESI-MS3 spectrum recorded from the fragmentation of isomeric precursor m/z 697 ion generates m/z 523 ion (Y ion of P2+2AB with two scars; Figure 4, structures Ia, Ib, IIa and IIb), m/z 363 ion (Y ion of P1+2AB with two scars; Figure 4, structure IIa) and Y ion at m/z 377 (P1+2AB with one scar; Figure 4, structures Ia and Ib). The fragment ion at m/z 377 can only arise from the proposed structure I and the fragment ion at m/z 363 can only arise from the proposed structure II. The simultaneous presence of these two ions confirms the proposed structures I and II. Thus the RE glycosyl sequence of the xylan chain of wheat endosperm AXs consist of an Ara branch attached to the RE Xyl residue (fragmentation pathway m/z 871→697→523→363) and/or penultimate Xyl residue (fragmentation pathway m/z 871→697→523→377). MS-based analyses do not provide information on either the anomeric configuration (α/β) or the D/L configuration of the sugars that must be obtained by other approaches, including enzymic and physical (e.g., NMR). For heteroxylans with the characteristic RE reduced tetrasaccharide (Xyl-Rha-GalA-Xylol), the NMR spectrum contains anomeric signals leading to the identification and sequencing of this RE oligosaccharide. We describe the use of 600 MHz 1D 1H-NMR spectroscopy as a single step method to determine the complete glycosyl sequence of the wheat endosperm AX RE oligosaccharide on the KOH-sol Fr, including the anomeric configuration (α/β) and the D/L configuration of the sugars. Resonances were assigned on the basis of published assignments of wheat AX oligosaccharides 17-18 (Figure 5, Table 1). 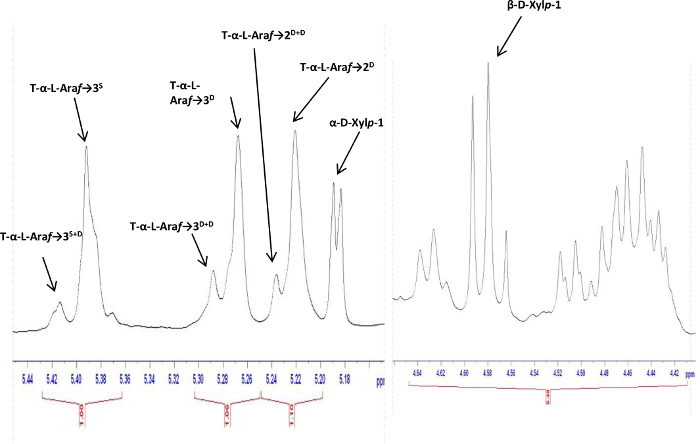 The 1H-NMR spectrum of the AX extracted from wheat endosperm is dominated by the anomeric chemical shifts at 5.39, 5.27 and 5.22 ppm that are assigned to the proton of a terminal α-L-Araf residue, attached to O-3 position (T-α-L-Araf →3S) of the singly branched (1,4)-β-Xylp backbone residues and both O-3 and O-2 positions (T-α-L-Araf →3D and T-α-L-Araf →2D) of doubly branched (1,4)-β-Xylp backbone residues, respectively (Figure 5 and Table 1). The signals at 5.41 are assigned to the (T-α-L-Araf→3S+D) H1 signal of α-L-Araf side chain attached to the O-3 position of the singly branched β-D-Xylp residue with adjoining doubly branched β-D-Xylp. The signal at 5.29 is assigned to the (T-α-L-Araf→3D+D) H1 signal of α-L-Araf side chain attached to the O-3 position of the doubly branched β-D-Xylp residue with adjoining doubly branched β-D-Xylp. The signal at 5.24 is assigned to the (T-α-L-Araf→2D+D) H1 signal of α-L-Araf side chain attached to the O-2 position of the doubly branched β-D-Xylp residue with adjoining doubly branched β-D-Xylp. Figure 1. Summary of Experimental Approach. A summary of the strategy employed in generating, purifying and sequencing the reducing end (RE) and internal region oligosaccharides of wheat endosperm arabinoxylans (AXs)is shown. This figure has been reproduced with permission from Ratnayake et al. (2014)2. Please click here to view a larger version of this figure. Figure 2. 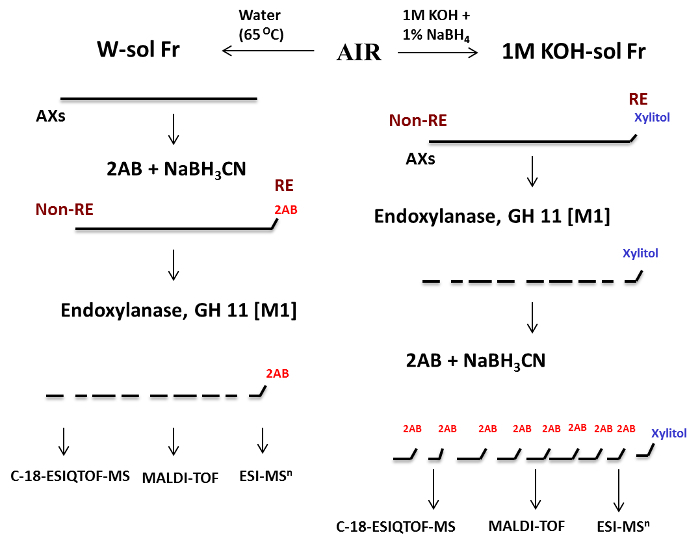 MALDI-TOF MS (A) and ESI-QTOF MS (B-E) analysis of native oligosaccharides released by endoxylanase from 2AB labelled W-sol AXs as outlined in Figure 1. 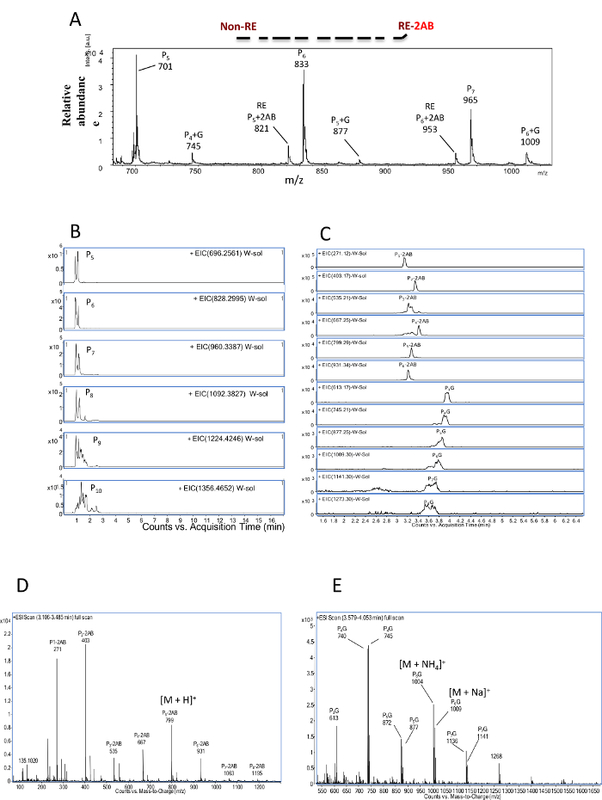 MALDI-TOF MS spectrum: (A) (The signals are identified as [M+Na]+ adduct ions); Selected ion scans of the ESI-QTOF MS chromatograms: B = P5-10 derived from internal region oligosaccharides (The signals are identified as [M + NH4]+ adduct ions); C = P1-6+2AB derived from RE oligosaccharides (The signals are identified as [M+H]+adduct ions) & P3-8G derived from acidic oligosaccharides (The signals are identified as [M + Na]+ adduct ions); D = ESI-Q-TOF full scan spectrum: region between 3.10-3.48 min, E = ESI-Q-TOF full scan spectrum: region between 3.59-4.05 min (The signals are identified as both [M + Na]+ and [M + NH4]+ adduct ions); P = pentosyl unit (either Ara or Xyl); G = uronosyl residue (GlcA); RE = reducing end oligosaccharides; 2AB = 2 aminobenzamide; EIC: extracted ion chromatogram. Please click here to view a larger version of this figure. Figure 3. The ESI-MS2, ESI-MS3 and ESI-MS4 spectra of per-O-methylated RE neutral glycosyl alditol (P4+Xylol) - m/z 885. The signals are assigned as the [M + Na]+ pseudo-molecular ion adducts. As several isomeric structures for a defined mass are possible then in isomeric structures Y and B ions are labelled in red and black, respectively. Each "scar" generated by the fragmentation event is marked as a solid line. X = Xylosyl residue; A = Arabinosyl residue. The ESI-MS3 spectra has been reproduced with permission from Ratnayake et al. (2014)2. Please click here to view a larger version of this figure. Figure 4. The ESI-MS2 and ESI-MS3 spectra of per-O-methylated 2AB labelled neutral RE oligosaccharide (P4+2AB) - m/z 871. The signals are assigned as the [M + Na]+ pseudo-molecular ion adducts. As several isomeric structures for a defined mass are possible in isomeric structures, Y and B ions are labelled in red and black respectively. Each "scar" generated by the fragmentation event is marked as a solid line. X = Xylosyl residue; A = Arabinosyl residue. This figure has been reproduced with permission from Ratnayake et al. (2014)2. Please click here to view a larger version of this figure. Figure 5. Anomeric region of the 600 MHz 1D 1H-NMR spectrum of the AX oligosaccharides generated by endoxylanase treatment of the KOH- Sol Fr. 1H chemical shift referenced to an internal standard of acetone at 2.225 ppm. T-α-L-Araf→3S: H1 signal of α-L-Araf side chain attached to the O-3 position of the singly branched β-D-Xylp residue; T-α-L-Araf→2D: H1 signal of α-L-Araf side chain attached to the O-2 position of the doubly branched β-D-Xylp residue; T-α-L-Araf→3D: H1 signal of α-L-Araf side chain attached to the O-3 position of the doubly branched β-D-Xylp residue; T-α-L-Araf→3S+D: H1 signal of α-L-Araf side chain attached to the O-3 position of the singly branched β-D-Xylp residue with adjoining doubly branched β-D-Xylp; T-α-L-Araf→2D+D: H1 signal of α-L-Araf side chain attached to the O-2 position of the doubly branched β-D-Xylp residue with adjoining doubly branched β-D-Xylp; T-α-L-Araf→3D+D: H1 signal of α-L-Araf side chain attached to the O-3 position of the doubly branched β-D-Xylp residue with adjoining doubly branched β-D-Xylp; 2-α-L-Araf→3S: H1 signal of 2-α-L-Araf side chain residue attached to the O-3 position of the singly branched β-D-Xylp residue; Please click here to view a larger version of this figure. Chemical shifts are reported relative to internal acetone, δ 2.225. Table 1. 1H-NMR signals of the xylo-oligosaccharides generated by endoxylanase treatment of the wheat endosperm KOH-sol Fr. Most matrix phase cell wall polysaccharides have seemingly randomly substituted backbones (with both glycosyl and non-glycosyl residues) that are highly variable depending upon the plant species, developmental stage and tissue type3. Since polysaccharides are secondary gene products their sequence is not template derived and there is therefore no single analytical approach, such as exists for nucleic acids and proteins, for their sequencing. The availability of purified linkage-specific hydrolytic enzymes has provided a powerful tool to degrade polysaccharides to oligosaccharides that can then be chromatographically fractionated, and when used in combination with chemical and physical techniques completely sequenced. The challenge is to then re-assemble these complex mixtures into the original polysaccharide sequence- one that is still to be successfully addressed. Here we describe an approach (whose order of application can be varied) that relies on the integration of established enzymic, chemical and physical techniques for the structural characterization of both the reducing end (RE) and internal region glycosyl sequence(s) of heteroxylans. An additional complementary technique not described here that has proved very useful for characterizing oligosaccharides is PACE (polysaccharide analysis by carbohydrate gel electrophoresis) developed by the Dupree19 group and it could easily be integrated into this protocol if the equipment is available. Furthermore, variations on the LC chromatography can also be useful, such as tandem inline hydrophilic interaction chromatography (HILIC) followed by RP chromatography offering the possibility of separating both untagged/tagged oligosaccharides in a single step. The techniques rely on tagging (with 2 aminobenzamide (2AB)) the reducing end (RE) of the heteroxylan chain prior to enzymatic (endoxylanase) hydrolysis. Two different approaches (see summary in Figure 1) are adopted. In the first, intact W-sol AXs are treated with 2AB to tag the original RE backbone chain sugar residue and then treated with an endoxylanase to generate a mixture of 2AB-labelled RE and internal region reducing oligosaccharides, respectively. In a second approach the KOH-sol Fr is hydrolyzed with endoxylanase to first generate a mixture of oligosaccharides which are subsequently labelled with 2AB. In this latter scenario the original RE of the KOH-sol AX would not be labelled with 2AB since it had been reduced to the glycosyl-alditol during the alkali extraction that contained the reductant, sodium borohydride (NaBH4). Therefore, the 2AB-labelled oligosaccharides generated post-xylanase digestion, will originate from "internal" oligosaccharides and the original RE oligosaccharide will contain a RE alditol without a 2AB tag (see Figure 1). This approach can also be applied to other classes of polysaccharides using (where available) the appropriate endo-hydrolases. The MS-based approach is significantly enhanced by methylation of the oligosaccharides generated after endoxylanase treatment since the un-methylated hydroxyl group(s) generated during gas-phase fragmentation of per-O-methylated oligosaccharides in MSn provides a 14Da mass difference "scar" that can be used to assist in the identification of the branching pattern and the glycosyl sequence.5-6 The identity of the pentosyl residues (and any sugar residue) cannot be made from the MS data alone but comes from having a knowledge of the composition of the molecule; where this is not available then the relevant monosaccharide and linkage analyses must be performed prior to making these assignments in MSn. Furthermore the signals corresponding to the RE acidic oligosaccharide alditol, generated from KOH-sol Fr (Xyl3-MeGlcA-Xylitol: m/z 761) and the characteristic dicot xylan RE glycosyl sequence (Xyl2-Rha-GalA-Xylitol: m/z 761), if present, are not able to be distinguished as both have the same molecular mass in native form but can be distinguished from their MS fragmentation (MSn) spectra which is best performed on the methylated oligosaccharides. Finally, MS-based techniques are unable to provide information on either the anomeric configuration (α/β) of the glycosidic linkage or the D/L configuration of the sugars- this must be determined by alternate methods, including enzymic and physical (e.g., NMR). This project was supported by funds from Commonwealth Scientific and Research Organisation Flagship Collaborative Research Program, provided to the High Fibre Grains Cluster via the Food Futures Flagship. AB also acknowledges the support of an Australia Research Council (ARC) grant to the ARC Centre of Excellence in Plant Cell Walls (CE110001007). ESI-MSn - ion-trap (Model # 1100 HCT) (Agilent, Palo Alto, CA). Pettolino, F. A., Walsh, C., Fincher, G. B., Bacic, A. Determining the polysaccharide composition of plant cell walls. Nature Protocols. 7, 1590-1607 (2012). Ratnayake, S., Beahan, C. T., Callahan, D. L., Bacic, A. The reducing end sequence of wheat endosperm cell wall arabinoxylans. Carbohydr. Res. 386, 23-32 (2014). Bacic, A., Harris, P. J., Stone, B. A. The Biochemistry of Plants, Vol. 14, Carbohydrates. Preiss, J. 14, Academic Press. San Diego. 297-371 (1988). York, W. S., O'Neill, M. A. Biochemical control of xylan biosynthesis - which end is up? Plant Biol. 11, 258-265 (2008). Fincher, G. B. Revolutionary times in our understanding of cell wall biosynthesis and remodeling in the grasses. Plant Physiol. 149, 27-37 (2009). Faik, A. Xylan Biosynthesis: News from the Grass. Plant Physiol. 153, 396-402 (2010). Scheller, H. V., Ulskov, P. Hemicelluloses. Annu. Rev. Plant Biol. 61, 263-289 (2010). Bacic, A., Stone, B. A (1→3)- and (1→4)-linked β-D-glucan in the endosperm cell-wall of wheat. Carbohydr. Res. 82, (13), 372-377 (1980). Comino, P., Collins, H., Lahnstein, J., Beahan, C., Gidley, M. J. Characterisation of soluble and insoluble cell wall fractions from rye, wheat and hull-less barley endosperm flours. Food Hydrocolloids. 41, 219-226 (2014). Pena, M. J., et al. Arabidopsis irregular xylem8 and irregular xylem9: Implicationsfor the Complexity of Glucuronoxylan Biosynthesis. Plant Cell. 19, 549-563 (2007). Andersson, S. I., Samuelson, O., Ishihara, M., Shimizu, K. Structure of the reducing end-groups in Spruce xylan. Carbohydr. Res. 111, 283-288 (1983). Mazumder, K., York, W. S. Structural analysis of arabinoxylans isolated from ball-milled switchgrass biomass. Carbohydr. Res. 345, 2183-2193 (2010). Kulkarni, A. R., et al. The ability of land plants to synthesize glucuronoxylans predates the evolution of tracheophytes. Glycobiol. 22, (2012), 439-451 (2012). Agilent MassHunter Workstation Software - Quantitative Analysis Familiarization Guide. Agilent Technologies. Available from: http://www.agilent.com/cs/library/usermanuals/Public/G3335_90061_Quant_Familiarization-EN.pdf (2010). Topspin User Manual. Bruker. Available from: http://www.nmr.ucdavis.edu/docs/user_manual_topspin_ts30.pdf (2010). Domon, B., Costello, C. E. A systematic nomenclature for carbohydrate fragmentation in FAB-MS/MS spectra of glycoconjugates. Glycoconjugate. J. 5, 397-409 (1988). Hoffmann, R. A., Leeflang, B. R., De Barse, M. M. J., Kamerling, J. P., Vliegenthart, J. F. Characterisation by 1H-n.m.r. spectroscopy of oligosaccharides, derived from arabinoxylans of white endosperm of wheat, that contain the elements ----4)[alpha-L-Araf-(1----3)]-beta-D-Xylp-(1---- or ----4)[alpha- L-Araf-(1----2)][alpha-L-Araf-(1----3)]-beta-D-Xylp-(1----. Carbohydr. Res. 221, 63-81 (1991). Gruppen, H., Hoffmann, R. A., Kormelink, F. J. M., Voragen, A. G. J., Kamerling, J. P., Vliegenthart, J. F. Characterisation by 1H NMR spectroscopy of enzymically derived oligosaccharides from alkali-extractable wheat-flour arabinoxylan. Carbohydr. Res. 233, 45-64 (1992). Kosik, O., Bromley, J. R., Busse-Wicher, M., Zhang, Z., Dupree, P. Studies of enzymatic cleavage of cellulose using polysaccharide analysis by carbohydrate gel electrophoresis (PACE). Methods Enzymol. 510, 51-67 (2012).